An in-depth gazetteer of the city of Korvosa as it exists under the rule of its new queen. An array of new rules options for characters, ranging from campaign traits to spells to magic items. An expansive appendix with statistics, descriptions, backgrounds, and rules support for the 12 most important NPCs in the campaign. A bestiary featuring nine monsters from the original Adventure Path making their debut under the Pathfinder Roleplaying Game rules. Dozens of new illustrations, never-before-seen characters, location maps, extensive new encounter locations, and more! Curse of the Crimson Throne is sanctioned for use in Pathfinder Society Roleplaying Guild. Short Version: A smart buy but held back by structural issues. It's hard to get better adventure value for your dollar than this or the Rise of the Runelords collected edition. If I were reviewing on that alone, this would be 5 stars and then some. But there's more to an adventure than that. The AP's hook is quite good, but almost immediately discarded in favor of saving the city. This can be helped a good session 0, but still feels artificial. Even looking at the new plot, many elements feel shoehorned in. People point to volumes 4 and 5 for this, but there are sections in 2 that exist only to kill time as the plot advances and an entire dungeon in 3 that is cool but can seem forced if the players don't kick in the door right away. Any of these alone would be fine, but each makes the next more obvious. That being said, there's a lot of cool stuff going on here, it just takes at least a star's worth of work to stitch it together. The "Korvosan Hierarchy" overview is not reprinted. The illustration on page 6 is exchanged for a cartoony new one on page 12 of the HC. Page 10 of AP#7 has a map where the 8 locations in Korvosa that are important for book 1 are marked and named. This map is reprinted on page 400 of the HC but that one shows ALL important locations of the campaign at once, marked with letters and numbers. "Lamm´s Lambs" stats are upgraded to young human on page 18 of the HC. "Yargin Balko" now has a full body illustration instead of an upper body one. "Hookshanks Gruller" gets a full body illustration. "Giggles" gets a fbi. "Gaedren Lamm" gets a fbi. King Eodred Arabasti gets a head illu. "Imps and Dragons" gets an illustration. "Meet the mob" gets a "Amin Jalento" head illu and his battle stats. The illustration of "Sabina Merrin" on page 25 is not reprinted (she gets a new one on page 455). "Cressida Croft" gets a head illu (and fbi on page 443). The Queens gets a new veiled head illu (the old one is more mysterious). The "renegade guards" stats in "All the Worlds Meat" get new stats. "Verik Vancasterkin" is upgraded from fighter 3 to fighter 4. The "Ambassadors Secret" gets a new head illu. The fbi of "Vencarlo Orisini" from page 34 is not reprinted. The fbi of "Devargo Barvasi" on page 37 is replaced with a new one that is very much less impressive. He is upgraded from rogue 4 to rogue 5. "Majenko" is changed from pseudodragon to house drake. The illustration on page 41 is replaced with a new one (page 57). Both are equally creepy. The "Trinia Sabor" fbi from page 43 is not reprinted (she gets a new look on page 460, but the old one is flashier). She is upgraded from bard 4 to bard 5. "The Shingle Chase" gets a better illustration. Curiously it features the old flashier Trinia Sabor outfit instead of the new. The Owlbear skeleton gets gorgeous art on page 59 of the HC. The cool illustration on page 52 is replaced by a cool new one on HC page 61. Cabbagehead´s head illu is replaced by a fbi. The "Gaekhen" head illu is not reprinted. "Vreeg" gets a much better new fbi. The famous "green dress Illeosa Arabasti" illustration from page 56 (on which the first miniature is based) is NOT reprinted! The Blackjack illustration from page 57 is replaced by a much better one on HC page 67. The 4 page Harrow article is updated to a 14 page one! The 8 page "people of the road" article about varisians is not reprinted. The 6 page Pathfinder´s journal is not reprinted. The illustration of the "Dream Spider", the only creature that hasn´t been adapted to a Bestiary yet, is not reprinted from page 82 but it´s stats are. The "Korvosas enemies" overview is not reprinted. While the new edition HC is better overall and everything needed for playing the campaign is included, updated and streamlined, quite a few cool things are left out. I´m glad i got the original AP #7 too. Read my full review at Of Dice and Pen. It was perhaps inevitable that Curse of the Crimson Throne would one day also receive a similar treatment to Rise of the Runelords. There’s no special anniversary to celebrate this year, but does there really need to be? 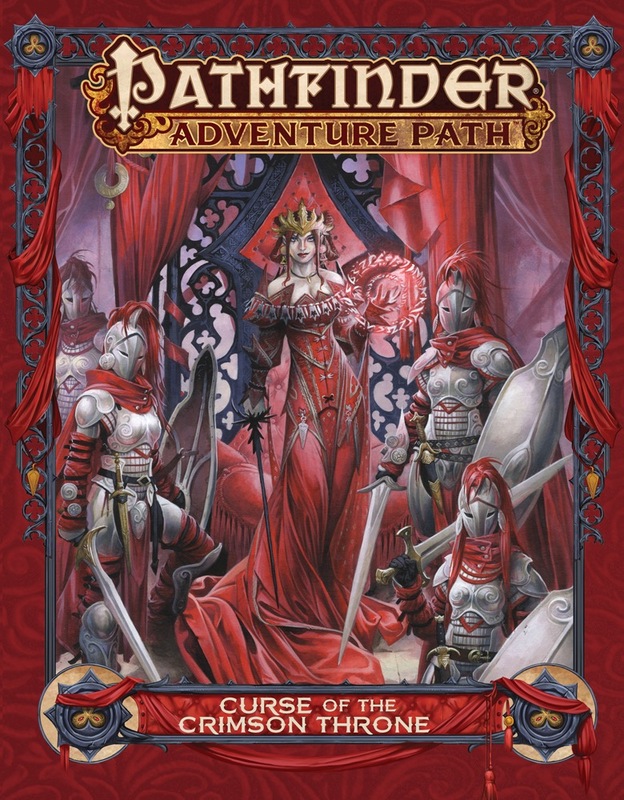 Much like its Runelords predecessor, the new hardcover compilation of Crimson Throne updates the adventure path to Pathfinder rules and also expands on the story where beneficial and streamlines in other areas. It also takes advantage of the most recent rules supplements, making use of newer monsters, classes, and feats where appropriate. At nearly 500 pages in length, it is actually a substantially larger tome than the hardcover Runelords (a good 50 pages or so longer), and its extra length is certainly put to good use. Indeed, it manages to make one of the best adventure paths even better. Welcome to the officially official first review of Captain Yesterday's not so official reviews of everything and life... or is that too cumbersome... how about an acronym... The O.O.F.R.O.C.Y.N.S.O.R.O.E.A.L... that will have to do for now. Now that I've milked how many words on that, let me say without a doubt this is one beautiful book, and hefty too! With upwards of 480 pages you really get your money's worth. This might take awhile so I'll most likely come back and edit and update, so stay tuned! The campaign traits - this is one of my favorite parts of the book, while there are only six traits, each one has two different options, they do an excellent job at both getting your party to really hate Gaedren Lamm, they also do an exceptional job at giving the player's a glimpse of Korvosa. So five stars! Alright, gotta go for now! But I'll be back soon! Announced at GAMA Trade Show and now available for preorder! Cover is very close to final, but may change when we go to print. Description is not final. Just in time for my birthday, awesome! I'm so glad we waited to run this! Looking forward to it! My Birthday is also in October. Thank you, Paizo! Question #1: Pre-ordering now will I be charged now or just when it is shipped? This is amazing. I ran this a few years ago and had a blast. Will there be a Pathfinder Pawns set in the near future to go with it? Can we get get flip-mats, minis and a new Korvosa campaign setting and poster map folio for this? Any quick sanctioning for PFS? If that's a problem for you/budgeting, I am an advocate of buying a Paizo.com gift card, applying it to your account and allowing the order to use that as its payment option. Best AP ever! So glad they give it the ROTRL treatment - I was desperately needing it without even knowing! This is an awesome adventure path, the best I've run so far! Too bad we finished it few months ago though. Sadly I won't be able to preorder through Paizo because international shipping and import tax. I'll definitely preorder via a Danish online retailer, though. Well, since my RotRLAE game is ~50% of the way through Book 5, this clinches what I'm running next. We have nothing to announce on that front at this time, but leaning to likely "no" as the Rise of the Runelords Anniversary Deluxe Edition was a pretty special 10 year anniversary product. 2) If we are seeing expanded rules sets utilized, any hints as to what we might see? Occult content? Unchained? Golarion specific rules options? Can you make the Canadian dollar go up before September? HA! Procrastination pays off! Paizo, do you take blood? The Best AP that Paizo ever published, now updated so I can run it without restarting everything?! Hopefully they do a limited. I love this path. Wow. Yeah. Gotta have this. My wife and I tore through the original CotCT AP in about a month, back when it was fairly new. I'm running this with my group currently and may miss out, but I'd be curious to know the answer to this. I've taken things further than just direct conversions, like making Grey Maidens Order of the Lion Constable Cavaliers. Also have converted a certain boss into an occult class. So it's definitely possible with some invention. Depends on how sacred they think the source material is, I suppose. Not surprised to see this one redone, seeing how it keeps coming up in other Adventure Paths. I hold out hope for some of the others eventually being updated as well, but this is a cool one! I've been holding out for this for years! This is the best AP, and we finally got an official coversion! It took us at least two years to complete CotCT! As with Runelords, my philosophy for updating it is to maintain and retain... don't change things unless it makes absolute sense to change things. 1) They are in almost every case direct conversions, but several of the elements introduced during Crimson Throne (be they character options like the Thunder and Fang feat or the chase rules, etc.) have since become part of the game's rules and will, of course, still be part of the campaign. 2) The expansions to the AP are more in the nature of story expansions rather than rules expansions... but there are a few new things in there that expand on elements throughout the currently available rules. I like what was done with the Rise of the Runelord's Anniversary. Will it be similar to what takes place here? I expect this will get the same treatment as Rise of the Runelords received: six Chronicle sheets, one corresponding to each of the original volumes. Any additional backmatter will receive the usual consideration regarding whether it should be incorporated into the campaign. That's still pretty impressive. I'd think that's a record. Oh, man! I'm just about to finish running this for my home group using the original books! All that time I've been swearing at how much I need to update to make it work with the Pathfinder rules. Will this get a new Player's Guide as well, like RotR did for the anniversary edition? And now we know why James got pulled off Strange Aeons. I hope Shattered Star, Second Darkness and one to two more of the older paths (I hope either Carrion Crown, Serpents Skull or Skulls and Shackles) go this way in a year or two. I love that you guys update them and add some new material. Great call! Sounds good! I got both the Deluxe special of Rise of the Runelords and the standard hardcover of it as well, which look fantastic next to the 1st print run of the orginial AP volumes. Figured I would check before offering my bank account as offering to the purple golem. 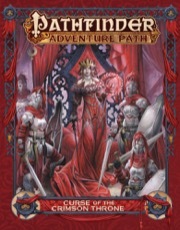 I'd personally like Legacy of Fire and Second Darkness before they revisit any of the actual Pathfinder APs. The 3.5 ones should get priority imo. Lol, we all know you got pulled off of Aeons to supervise and help with this or Shattered Star or Second Darkness. Hopefully all of these will go the same route, along with a few other older APs that are popular (say Carrion Crown that would be great with Investigator classes and some new baddies). Just go ahead and take my money already (I think I can function perfectly well on one kidney). I wouldn't hold my breath for any PF-era APs to be done like this. That would be suicide for Paizo. Nice! I'm looking forward to this. Definitely running this as my next AP. September is not too far off. I hope Shattered Star, Second Darkness and one to two more of the older paths (I hope either Carrion Crown, Serpents Skull or Skulls and Shackles) go this way in a year or two. I love that you guys update them and add some new material. Great call! Don´t hold your breath for other updates. James said as much in another thread. IF this happens at all, my guess would be that it would be the remaining two 3.5 APs, nothing newer.